PanARMENIAN.Net - Samsung is coming off of a disappointing launch for its Galaxy S9, but that doesn’t mean the company is shaking things up for its next major smartphone. The Galaxy Note 9 is officially being announced today, and Samsung is doubling down on everything that the Note series represents: productivity and performance. It has the best specs you’ll find in any flagship Android phone, the screen is bigger, its S Pen has more tricks than ever before, and the battery is huge. Oh, and Samsung’s DeX software is now built right into the phone — no dock required — so you can plug it into any external display for a desktop-like experience. The Note 9 will be sold in two configurations: there’s a 128GB / 6GB RAM model for $999 and a top-tier 512GB / 8GB RAM version for $1,250. Preorders begin on August 10th, and the phone will be available on August 24th at all major carriers or direct (and unlocked) from Samsung. 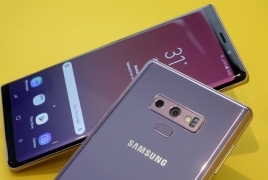 By looks alone, the Note 9 is nearly identical to its predecessor, save for the rear fingerprint sensor that has been moved to a more sensible spot below the camera. All of Samsung’s other hardware signatures like water resistance, fast wireless charging, expandable microSD storage, and the headphone jack are still here. (So is the Bixby button, for that matter.) Toss a 512GB microSD card into the 512GB Note 9, and you’ll have a phone with 1TB of storage. That’s nuts. The Note 9 ships with Android 8.1 Oreo and the same user experience as Samsung’s last several phones. Samsung Pay is still present, and having the ability to mimic a credit card’s magnetic stripe at stores where NFC payments don’t always work is a nice fallback.